This romantic painting by Albert Moore epitomizes the sensual search for beauty by the painters in the “Aesthetic Movement” which occurred in Britain from about 1850 to 1900. 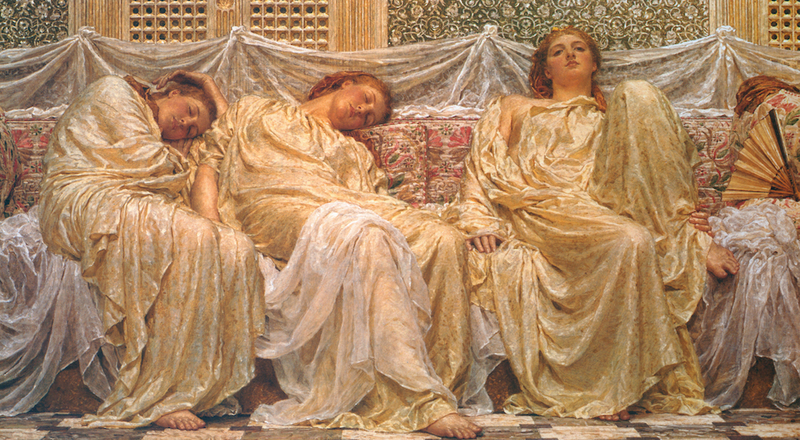 Many in this circle of artists believed in the dangerous idea of “Art for art’s sake.” “Dreamers” by Albert Joseph Moore, 1882, oil on canvas, courtesy of the Birmingham Museum and Art Gallery, U.K. Lately I’ve been struck by the life-changing power of what some might call dangerous ideas. In reading a superb biography of the ideas of Emerson I learned that he was born in 1803 right near the Downtown Crossing subway stop. Every time I walk those streets I think about Emerson and the enormous breadth of his largely self-taught education. It’s inspiring. Turns out Emerson’s older brother, William, who had plans to join the priesthood, decided in 1823 to study Theology in Germany. There, he encountered some of these dangerous ideas and not only did he question his faith but he gave up his plans and returned home “demoralized.” Robert Richardson explains, “his intellectual interests and ambitions had been permanently numbed by his experience in Germany.” What on earth? Ideas so radical that reading some of the (then new) German philosophers completely transformed his life? I find this astonishing and am trying to imagine what ideas in our modern world could have such an impact? The only thing that comes to mind is like something out of Sci-Fi movie with positive proof of intelligent life in the universe beyond our own. The dangerous ideas Emerson’s brother encountered can likely be traced back to that metaphysical troublemaker Immanuel Kant. His Critique of Pure Reason published in 1781 exploded like a cultural fragmentation grenade and the treacherous splinters of logic and rationality went everywhere. Just as forensic experts can trace explosive “signatures” in a bomb blast, we are still pulling out impacted pieces of Kant-inspired shrapnel in music, literature, politics, religion and for the subject of this discussion – art. Seems like everything I pick up these days traces itself back to Kant and I’ll probably investigate him further down the road but, for now, he seems to be at the core of one of recent art’s most influential and dangerous ideas. It seems innocent enough and it is such a cliché now you can’t even see its original audacity. It is that deceptively harmless phrase, Art for art’s sake. Could such a nonsense phrase have any impact at all? How can such an innocuous sentence with its silly repetitive logic mean anything? And why in the world would it be important to anyone, let alone dangerous? “Flowers are free beauties of nature ….. Many birds (the parrot, the humming-bird, the bird of paradise), and a number of crustacea, are self-subsisting beauties which are not appurtenant to any object defined with respect to its end, but please freely and on their own account. So designs a la grecque, foliage for framework or on wall-papers, &c., have no intrinsic meaning; they represent nothing – no Object under a definite concept – and are free beauties. We may also rank in the same class what in music are called fantasias (without a theme), and indeed, all music that is not set to words. Kant’s process is probably more significant than these actual words. It’s hard to imagine how powerful these ideas must have been when they were new. I thought these ideas about the nature of beauty and art being free of purpose were much older. This just shows how we take stuff for granted. What do I mean? 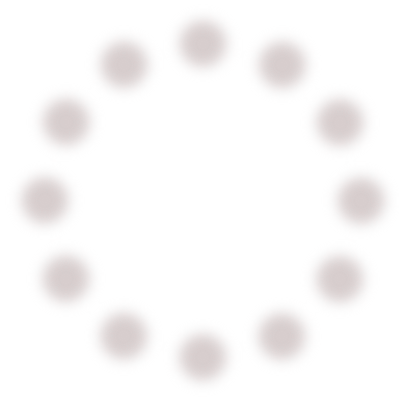 I listened to a lecture about the history of mathematics the other day and another one of these dangerous ideas popped up that knocked me flat. I knew the number zero was a red hot lightning rod but I had not even considered what math must of been like before the concept of negative numbers? They were conceived first in China and then in India, but I learned there were all sorts of mathematical systems that did not use them at all! I realized I find it impossible to even imagine a math that makes any sense at all without them. I can’t do it. You can chalk negative numbers up along with the abolition of slavery, women’s suffrage, and photography as ideas and inventions which are so integral to the way I think that it is really hard to imagine what the world was like without them? Art for art sake is everywhere. It even surrounds the famous roaring MGM lion. Art for art’s sake, it turns out, is another one. In French, the original phrase is L’art pour l’art. 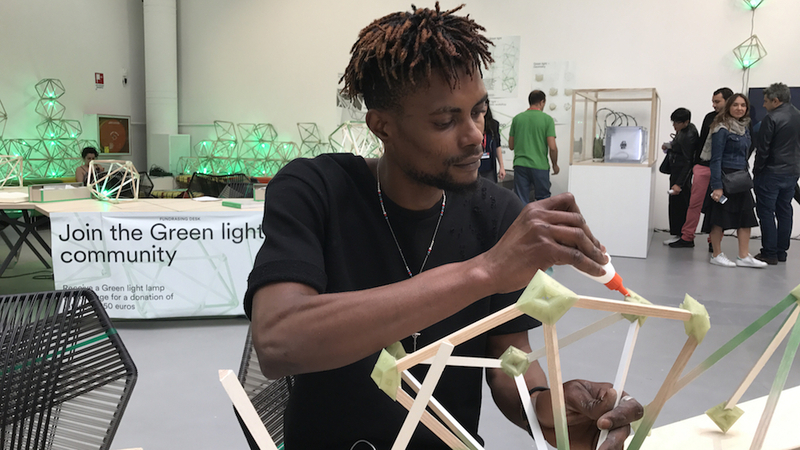 It was obvious to me from some of the comments and letters I got in reaction to the Blog about the recent Biennale that most of the people I know accept Art for art’s Sake as gospel and to think otherwise is maddeningly difficult to do. It is one of those hackneyed ideas we don’t even see anymore but it is a window through which many of us see art these days and even if it is largely transparent and barely visible it still filters what we see. Look, there it is plain as day on the golden frame encircling the MGM lion, Ars Gratia Artis, the latin version of Art for art’s Sake. We are so anxious for the lion to roar and the movie to start we don’t even see it anymore. But where did this idea come from and what does that little phrase in Latin or French or English actually mean? Turns out, it is not old at all. It is a relatively modern idea that springs most vividly to life in the Victorian era. Part of the reason we take it for granted is that it was hugely influential. To research this term you quickly bump into a Who’s Who of eighteenth and nineteenth century art, poetry, literature and philosophy and metaphysics including Immanuel Kant, Benjamin Constant, Charles Baudelaire, Algernon Swinburne, Théophile Gautier, William Blake, Victor Hugo, Walter Pater, James MacNeil Whistler, Walter Benjamin and even Edgar Allen Poe. Edgar Allan Poe captured just a few months before his death in a gorgeous daguerreotype now in the collections at the Getty Museum. 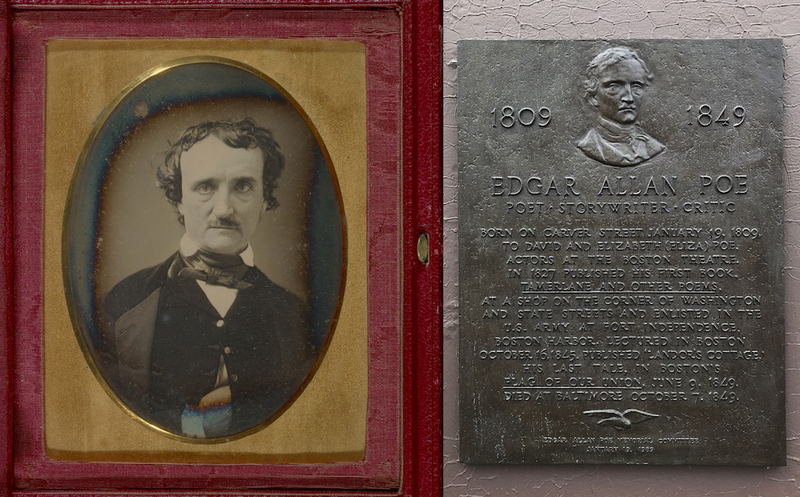 Poe was born in Boston in 1809 just a few blocks from Emerson’s birthplace. A historic marker is all that is left of Poe’s birth house. The ideas get picked up by many but perhaps most influentially by Poe around 1850 when a posthumous essay of one of his lectures is published. The Poetic Principle brings the idea back to life for a new generation. How ironic the author of The Raven makes such an influential statement from the grave. Poe’s essay gets translated into French by Baudelaire (who adds plenty of his own commentary) and then Swinburne translates the Baudelaire back into English. It is sort of a marvelous Victorian game of telephone and the details each of these great minds add to the developing story are fascinating. It has been assumed, tacitly and avowedly, directly and indirectly, that the ultimate object of all Poetry is Truth. Every poem, it is said, should inculcate a moral; and by this moral is the poetical merit of the work to be adjudged. We Americans especially have patronized this happy idea; and we Bostonians, very especially, have developed it in full. We have taken it into our heads that to write a poem simply for the poem’s sake, and to acknowledge such to have been our design, would be to confess ourselves radically wanting in the true poetic dignity and force: — but the simple fact is, that, would we but permit ourselves to look into our own souls, we should immediately there discover that under the sun there neither exists nor can exist any work more thoroughly dignified — more supremely noble than this very poem — this poem per se — this poem which is a poem and nothing more, this poem written solely for the poem’s sake. What Poe applied to poetry soon found it’s way by logical extension to art in general. Poe (like Kant before him) may not have foreseen the chaos to follow, but that is often the unintended consequences of dangerous ideas. The dangerous part is to uncouple art from purpose. With this idea art no longer has to perform any moral function. It does not need to uplift or improve or do anything at all. If it does those things, some (like Benjamin Constant) look at it as a “perversion,” others don’t seem to care but the point is, it is no longer required. Please take away your morality and while your at it, we don’t really need that narrative story any more do we? You can leave behind the politics that goes along with the patronage. Please leave out the religion. Ok, while you are at it why not take out that need for representation? Who needs it? After all, we now have photography for that. Accuracy of representation is no longer the point. In Matisse’s famous phrase, “It’s not a woman it is a painting” (meaning I don’t care if you think it looks like a woman – that is no longer my artistic purpose). If I’m the artist this is pretty liberating (and pretty scary). I no longer even have to paint stuff which looks like stuff, I can paint any damn thing I want! What I like here is two things. The first is the Greek reference since TELOS comes into play with the idea of “auto-telic” but more to the point is the wonderful value judgement. The art is qualified. We have true art (and one assumes false art). Art that is free of moral function (or divorced from those constraining principles like Poe’s “Truth”, or religion, or narrative, or politics or certainly “social practice”) is held up as better art than art that does something. Perhaps more than that, art which does anything. Art connected to any ulterior motive is called out as simply not as good. Stop the press! This is another part of what I mean by dangerous. With this criteria in play does it means that Duccio, Poussin, or Botticelli (or you can insert any of your favorite artists before say 1800) are “less than” artists who do not tie their art to a moral, religious, or philosophical agenda? As always, the social context is vital. This debate is playing out in the United States, France and England in Victorian times where censorship in greater or lesser degrees is defining what artists can and cannot do. The divorce of morality from art is a big deal, a dangerous course, and the consequences for society in general and for the artist in specific are severe. Remember, this is a time when what you did in your boudoir or created in your studio could put you in jail. This portrait of Venetian Doge Andrea Gritti was believed by Ruskin to be painted by the 16th Century master Titian. Ruskin’s attorneys used it to represent “true art” as opposed to James McNeill Whistler’s “Falling Rocket”, painted in 1877. Prettejohn ties the concept tightly to the Aesthetic Movement in England. The ideas finally boil over in a famous court case in 1878. An important arbiter of taste, John Ruskin, becomes outraged (in a self published publication that was sort of like a nineteenth century Blog) by a new painting of James McNeill Whistler. Ruskin famously writes, ‘I have seen, and heard, much of Cockney impudence before now; but never expected to hear a coxcomb ask two hundred guineas for flinging a pot of paint in the public’s face.’ Whistler sued him for libel and – as Linda Merrill says so succinctly in her subtitle to her excellent book, Pot of Paint – aesthetics went on trial. The trial is fascinating although Ruskin unfortunately is too infirm to testify. His lawyers, under his direction, bring in a painting by the 16th Century master Titian, as an example for the jury of what true art is supposed to be. 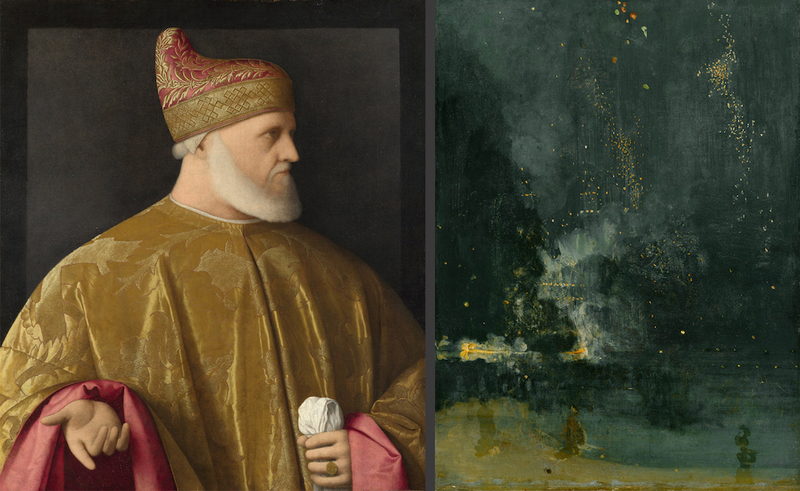 Ironically, the Titian portrait (one of Ruskin’s prize possessions) is years later discovered to be by someone else. So much for “Truth.” After all the testimony and absurd comparisons and gossipy press reports the jury splits the difference. They find Ruskin guilty of slander but only award damages to Whistler of one farthing. Whistler had proved his point but the quarrel had little value in the commercial sense. 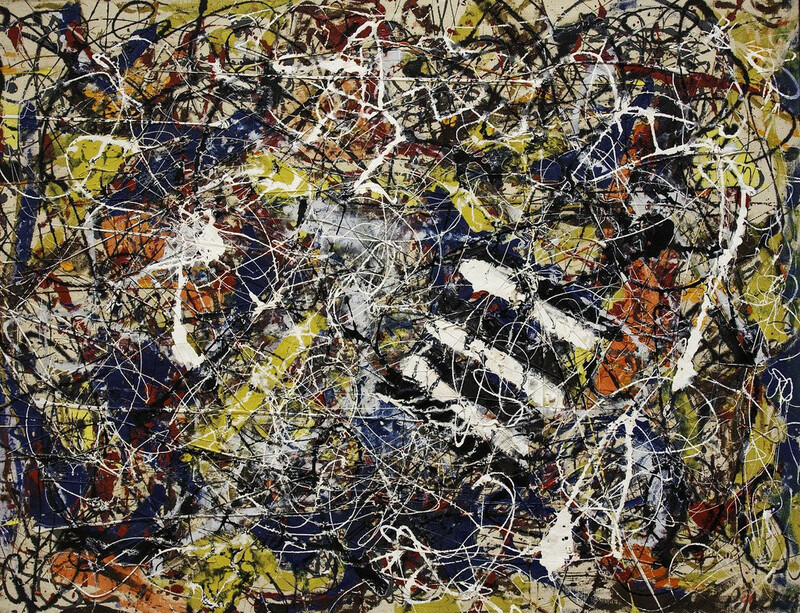 “Number 17A” was painted by Jackson Pollock in 1948. It recently sold at auction for over 200 million dollars. One wonders what Ruskin, Whistler or the jury would have thought if they could have seen Jackson Pollock literally flinging his pots of of paint just seventy years later? Do dangerous ideas ultimately have any value? 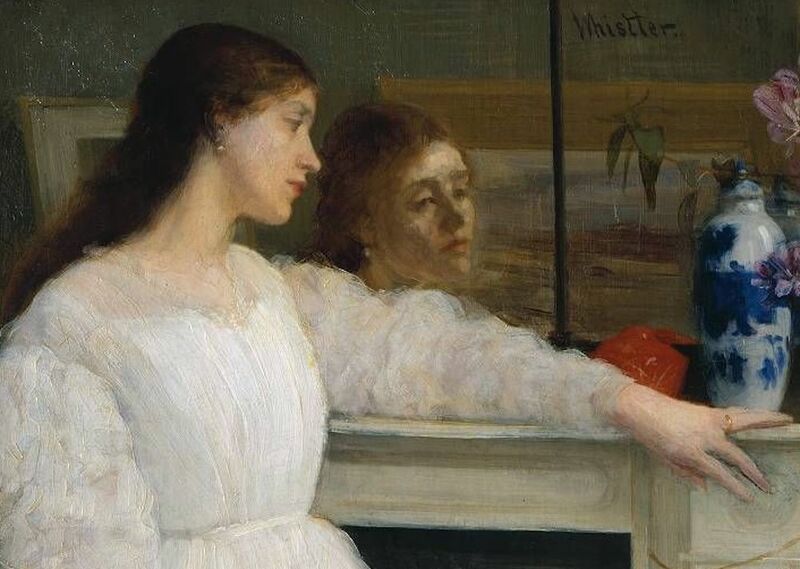 Just imagine how they would have felt to learn those canvases are now worth (not just the outrageous 200 guineas for Whistler’s infamous painting) but rather hundreds of millions of dollars. Another amazing piece, Tom. It is so interesting how language changes our perspective. I know you are not in Boston now, but I do know that you follow the political news. Your article made me wonder what words or sayings will come out of our current situation – will facts be forever allowed to be considered “alternative”? will news no longer have a relation to the facts? are we going to look back at these times as a strange blip ( hopefully), or as a real change – as our understanding of art changed over the last century that you documented so well? Thanks so much for your perspective on art – lovely to think about art in these times. Thoroughly thought provoking. Always educational. Yet another thoroughly researched, thought provoking and insightful blog kept me entertained earlier today. I learnt much, but I always do, this time on “art for arts sake”, a phrase that up until this moment was taken on face value. Clearly there is more to Ars Gratia Artis than originally thought, and I thank you for expanding my art horizons yet again. It is always such a pleasure to read your penmanship! I think the idea of freedom in art, to NOT have a didactic purpose, to NOT have to live up to the belief in the good, the true and the beautiful, is what is meant by Kant here. He was unbinding the artist from big moral imperatives, for every work. The Aristotelian idea of matching one’s work to a goal of everlasting beauty, real truth which would not waver, and goodness which was going to always and everywhere be understood, was a hard one to live up to. And then there was the medieval idea of everything having multiple layers of purpose; such that a moral imperative could be discerned from a work of art; or, in the case of the windows in the Cathedral at Chartres, it was equivalent to a graduate school seminar in Biblical studies to look at the windows. 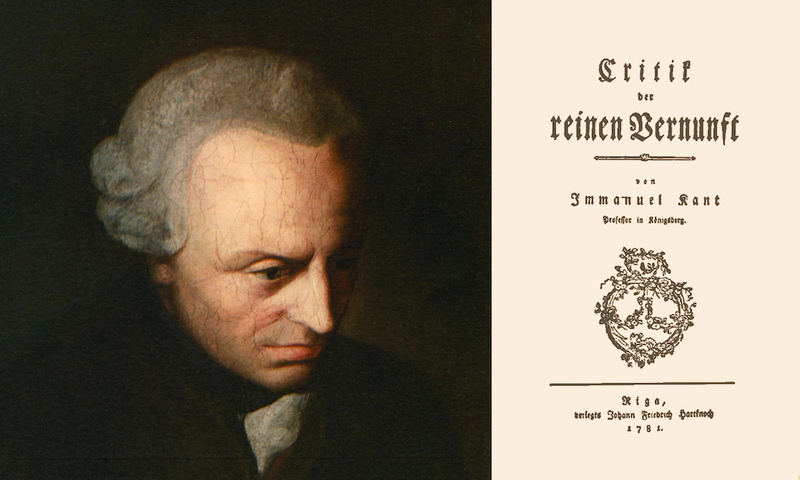 Kant is trying to allow for something like a musical Fantasia, that is, an idea which has no words, no real images, no touchstone in the world of logic and virtue. So he opened a big Pandora’s box to non-representational and abstract art. Some people do not “get it” even now, that this is possible, and that artists are in some ways on a trajectory which doesn’t have representation at its base. Following a particular curve in thought, of a group of artists, in an idea about how paint could be used, or how a figure might occupy space, and be made of interesting and new materials, is part of modern art. I was thinking about Guernica, and the idea of portraying the horrors of war. And then black-on-black images of grief or rage. How one can sometimes find a resonance in oneself for something which may not even have been anything like what the artist was thinking. I am perturbed about the painting of the woman in 4 different postures of lethargy, sleep, desultory state, barely lucid state; and wondering why he called it “Dreamers”. It is one person, not 4 different people. And she is very close to the same core experience in each of these portrayals. And they are all lush and beautiful, with draperies and color, like golden apples. What does this intend to say? Is she bored, is she hiding her real self? What is her relationship to the artist? The title doesn’t make sense to me. Does it have to? Should it have to? I want it clear, like “The Dying Gaul”. Or give it a better name. And then I wonder if there is any key in Kant, to that set of 4 sleepy portraits of the same woman. You are again a piquant witness to the world of visual art. Thanks for asking this question! And then there was Oscar Wilde to tart up the debate. It’s really Samuel Beckett who puts everything in his VOID who gets it right. Tom you really know how to fence with the best..Bravo..you rascal. I really miss our provocative chats..You are a Renaissance thinker.